Over the years I have learned many ‘tricks’ to either make a small room appear larger, or adding storage when space is limited. I hope some of these ideas can help you out! Small rooms may be cozy and efficient, but you can often feel cramped and very difficult to keep organized. Well luckily there are many ways to make a small room appear larger than it really is. Here are some clever tips and tricks of the eye that can be easily incorporated into any small room. Tip 2- Purchase/add legs on your furniture that show. I know, the mirrors were an 80’s idea but, you can really work magic with mirrors. They are an ideal accessory for making a room appear larger. Mirrors can be installed on sliding closet doors or as a covering for an entire wall (preferably near a window). Mirrors serve two beneficial purposes: First, images, accessories, wall hangings, furniture, and light from lamps or recessed lighting will be reflected into the room. Second, during the day as natural sunlight pours in through the window(s), it reflects off the mirrors making the room brighter and lighter. When I purchased this house it had mirrors in the family room. I was thinking of removing but, during the day the sliding windows on the other side of the room, reflect all that light and makes the room so much larger appearing. On a bedroom closet doors, I painted big stripes horizontally. All I did was add frost to every other stripe. It came out so nice and modern looking! Notice the lighter room colors. If you have open shelves in your kitchen, store items with like colors .This helps to keep a small room looking organized and neat rather than cluttered. It also helps to space out items on open shelves and use them for display as well as storage. Stripes—both vertical and horizontal—can create the illusion of more space. Vertical stripes help to draw the eye upward and horizontal stripes help to make a room seem wider. Be sure to select colors that go with the rest of your finishes and fabrics in the room. I did this for someone in their home. I used a different sheen in the stripes. One in a eggshell and the other in a satin, in metallic paints. It came out beautiful! You can create an illusion of your small room being much larger than it is by installing a band of small molding, about a foot down from the ceiling around the entire room. Paint the ceiling above the molding a color different from the wall area below the molding. Keep in mind the suggestion about using lighter color paint. In this case, the ceiling could be white or cream with the walls a lovely pastel like pale yellow or blue. Do you see in the pic how the molding is installed a foot down from ceiling? I think it would have looked even better if the top of molding was painted a lighter color. I can almost hear what your thinking on this one. Learning how to make a small room look bigger starts with the clutter. Too much clutter overpowers the square foot and will make the room look smaller. The adage less is more, holds true when there’s too much stuff taking up precious space. A quick way to make room is spending the day decluttering. Do this by reducing the number of decorative accessories, knick knacks, artificial plants and flowers, or any other items you have on display that serve no purpose. Reducing the clutter has a positive impact on the visual size of the room. I know a lot of people love the darker floors but as the same with color schemes, choosing a light-colored flooring can create the illusion of a larger space. If you don’t have the option of replacing dark wood floors or carpet, use light-colored rugs to cover as much of the area as possible. Whether you use area rugs or able to install new flooring, choose colors that will complement the wall paint. Sometimes the only thing lacking in a bathroom is storage space. When there’s no extra floor space, consider a built-in cabinet that utilizes the open space within the walls. You/ contractor can build this useful cabinet in a bathroom or even a kitchen wall. You could also use glass shelves in the bathroom which will utilize space and doesn’t look ‘heavy’. The shelves have to be made between the studs in the wall. If you want to try it yourself, I found a great tutorial here. 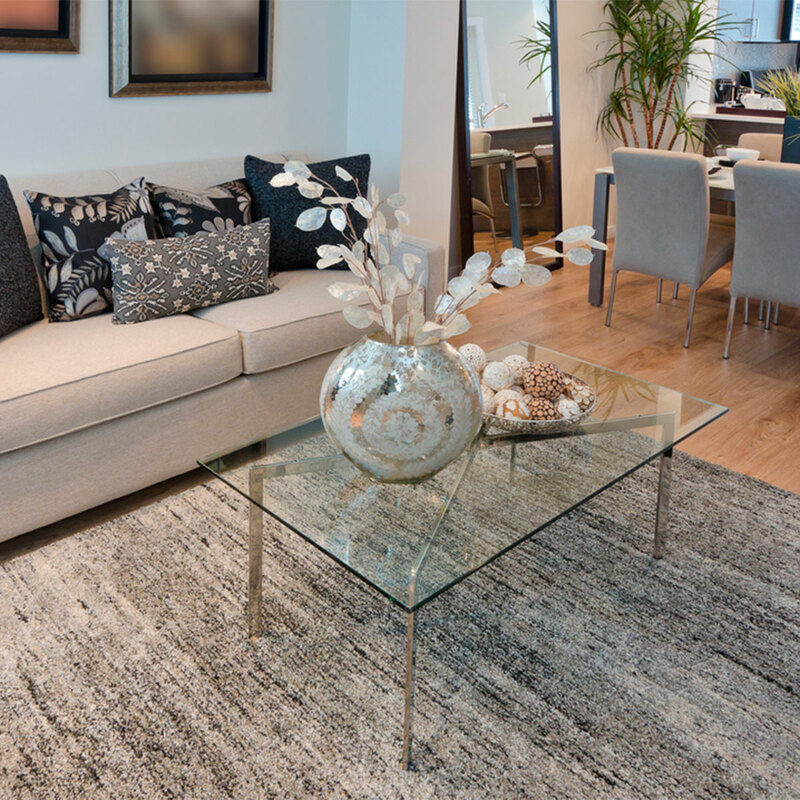 When purchasing furniture for a smaller room opt for see-through furniture, such as a glass coffee table or clear acrylic desk. Clear furniture helps to make a small room feel more open while still proving a useful surface and a unique design element. I opted for a large glass coffee table in my living room. I also went with light colors and a beautiful rug underneath it! A floor-to-ceiling bookcase shows off a small room’s height while adding a lot of space-saving vertical storage. I know all you kitty lovers loved that pic! The plain furniture in this pic is nice, I think they just need to add some of their own personality into the room. I can honestly say I stuck to most of the above in my living room, except my coffee table may be a little over cluttered. I hope that you enjoyed this post and I gave you some ideas for your own home. Great ideas! I love the striped living room walls in #6 and the built-in cabinet in the bathroom! I’m so glad Alunaria!! Thank you for enjoying! I just applied to rent my first place. This was very helpful while brainstorming decorating ideas.